Hey guys it’s Ash and today I’m going to give you guys my rankings of all the cards in Clash Royale, from the best cards in the game to the worst cards. How successful and popularly used these cards are among top players on the Ladder, Tournaments, and Challenges. How versatile these cards are. Meaning that they can be used successfully in many decks, not just one or two. The potential of these cards in the current meta and the meta that would be divulging within the next couple of weeks. Let’s start with the top 5 cards, which are the main utility cards that will almost always give you an Elixir advantage in a battle. These 5 cards are the most popularly used cards among top players. If you scroll through all the decks the top 200 global players are using right now, you’re going to see that their decks are filled with these cards. The Log is the most used card among top players. It provides incredible value against all ground units, kills Goblin Barrel, Dart Goblin, Princess, Skeleton Army, and Goblin Gang for a positive Elixir trade. Zap is also a super versatile card that can instantly kill threats such as Skeletons and Bats, as well as stun and reset the target of units, as well as reset the charge of units such as Inferno Tower, Inferno Dragon, Battle Ram, and so on. All for just 2 Elixir. Ice Spirit is another super versatile and useful card. Only 1 Elixir allows you to Freeze and reset your target, as well as deal splash damage, can 1 shot Bats and Skeletons, and is an excellent card for cycling and keeping your Average Elixir Cost low. Knight is the best support distractor and mini-tank in the game. He has very great HP for only a 3 Elixir card, while also has a fast attack rate and can deal a lot of damage if left alone. The Elixir Collector is at the top of being one of the deadliest cards in the game. It gives beatdown decks their identity. With it you can form insane pushes with Golem, Giant, Three Musketeers, Battle Ram, and so on. Almost all powerful beatdown decks by top players carry this card. Next, we have the 4 most powerful offensive threats in the entire game. These cards can absolutely devastate your opponent with a high return value with low risk. Even after her recent nerf, she’s still one of the most deadliest offensive threats in the game. It’s just insanely scary when she’s behind a tank such as Giant or Golem or even a 2 Elixir Ice Golem. She poses way too much pressure, as you not only have to worry about her behind a tank, but also her Bats that she continually spawns. Battle Ram is a super dangerous card. It can get a charge going fast, and if its charge lands on your Arena Tower, it does massive damage. You not only have to worry about its charge, but also the two Barbarians, which together can deal much more damage if left alone. Although there are plenty of ways to stop the Graveyard Skeletons, there are very few ways to stop it when it’s used in combination with a spell card such as Poison, and when your Arena Tower is distracted. And damage racks up incredibly fast if you don’t have a good answer for it. Three Musketeers have never been as strong as they are now. Thanks to Battle Ram and Heal Spell making Three Musketeers even better, the Three Musketeer Battle Ram deck is one of the most used decks by top players, and it’s incredibly difficult to stop it when they’ve safely placed down an Elixir Collector. Next are the four big spells of Clash Royale. One of these spells is almost imperative for carrying in most decks. Poison is one of the best counters to Graveyard, as it can kill Skeletons in one tick. Its large radius is also super beneficial on both offense and defense. It’s also very useful against Night Witch. Fireball is becoming a very important card to carry right now as opposed to Poison because the Heal Spell card completely cancels out Poison’s damage. Tornado is a super powerful defensive card. It not only makes it very difficult to commit too long in a single lane, but it also makes it very difficult to play certain cards early due to Tornado’s ability to pull those units towards the King’s Tower and activate it. The new Heal Spell card has quickly become one of the deadliest cards right now in the meta. The bigger the combination of troops, the more powerful Heal is, meaning if you allow your opponent play something heavy such as Three Musketeers and Battle Ram, then you’re going to have a really hard time stopping that when Heal can make your spell cards quite useless. Ice Golem doesn’t attack units like a Knight would, but the Ice Golem is cheaper and his death splash damage and slow down is super useful against big threats. Not only that, you can use him to kite away threats such as a P.E.K.K.A. Now that Goblins can survive against a Zap Spell and since the 1 Elixir Skeletons card got nerfed to only 3 Skeletons, the 2 Elixir Goblins card has taken its place in most decks. Even though Goblins die to The Log, this can actually be a good thing as this will allow you to bait The Log and use certain defensive cards such as Tombstone safely. Princess is currently a pretty underrated card, and probably should see more usage in non-bait decks. Although she’s super good in Log bait decks, she’s also super useful in other decks with her long range splash allowing her to safely sprinkle Arrows around from a distance or the other lane. Mega Minion is still a super versatile card for only 3 Elixir. Can survive a Fireball, does a lot of damage, and of course it flies and targets flying units. Mega Minion is a very useful card right now because of all the Night Witches flying around. Bandit is a very powerful card, costing only 3 Elixir while being able to instantly pressure an opponent with her speed and dash. If you don’t react quickly enough or have a proper counter in your hand, then she can do a lot of damage quickly. Electro Wizard is a very powerful card on defense and offense. He comes with a Zap, which can stun and reset his targets. He can survive a Fireball, making him pretty deadly behind a tank. He makes defending easier with his constant stun. Baby Dragon is like the all inclusive versatile card. Decent HP, damage, speed, everything is decent with the Baby Dragon. Can’t go wrong. Skeletons used to be a top 5 card when there were 4 of them. Unfortunately, removing one of them took a big hit. Going from 4 to 3 is a 33% difference, and that’s huge. Still, Skeletons are a very useful card for cycling and keeping your Average Elixir Cost low. Although Goblin Gang now has one less Spear Goblin, it is still a very useful card and is excellent for baiting The Log and can deal a large amount of damage if left ignored. Executioner is one of the best defensive cards in the game. Couple him with Tornado and he can shut down huge pushes. Not only that, he’s the best counter to the Night Witch. Goblin Barrel is a very deadly card due to the fact that you can’t use Zap to kill the Goblins, so you have to mostly rely on using The Log, which can be baited pretty easily by cards such as Princess or Goblin Gang. Hog Rider is almost always among the most popularly used offensive cards in the game, ever since the start of the game. Fast, bulky, and does a lot of damage. For only 5 Elixir, the Giant has so much more HP than a Hog Rider, but is slow. Being slow is actually a good thing for him because you can build up really big pushes while using him as shield. 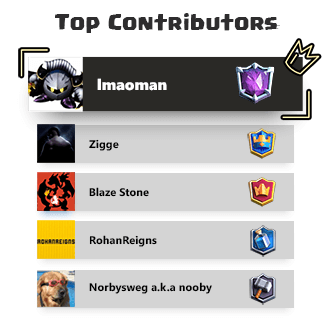 P.E.K.K.A is currently seeing the most usage ever right now because of how well she’s able to counter common threats such as Battle Ram, Three Musketeers, Hog Rider, Giant, and Golem. Although Golem costs 8 Elixir, he can reward you big time if you make smart positive Elixir trades or carry the Elixir Collector. If you give your opponent the Elixir lead, it becomes an absolute nightmare to stop a Golem backed up by something like a Night Witch and Baby Dragon. Miner is quite an underrated card and is mostly seen in bait decks. But he’s very useful in other decks and is also a great counter to the Elixir Collector. Using him to shield Goblins, Skeletons, Bats, or Minions can allow you to deal a massive amount of damage to an Arena Tower. X-Bow is a super deadly card, as if you allow it to lock onto your Arena Tower, then prepare to lose a of HP as you helplessly try to take it down while your opponent continuously counters your counters. Similarly Mortar can be used the same way, less damage over time, but for the price of only 4 Elixir, allowing you to cycle quicker. 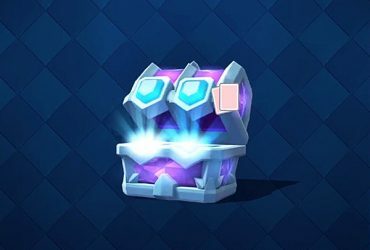 The best X-Bow or Mortar siege players will play aggressively on defense when they’re leading, and then finish you off by cycling spell cards such as Rocket or Fireball at the end. Because of that, it’s very unsafe to take Tower damage against a Rocket user. If the player is losing, he can play aggressively on defense, while destroy your Arena Tower with Rocket and run away with a draw. Rocket also punishes heavy pushes. Just don’t miss. Lightning has a very big radius and can deal damage to three units with the highest HP. It’s biggest use is its ability to also stun and reset Inferno Towers. While it’s hindered by players who use Battle Ram, as the Battle Ram acts as three units, the Ram and the two Barbarians, so Lightning isn’t seeing as much usage as it should be. For decks that are very weak to Minion Horde, Arrows offers great value with its very large radius. Not often seen due to The Log, Zap, Fireball, Poison, and Tornado being more versatile. But with the rise in usage of Heal and Minion Horde, more players are using Arrows. Minions are a cheap 3 Elixir card that deal a lot of damage together, fly, and also are a great counter to big threats such as Night Witch and Graveyard. Oh and they can’t be killed by Log or Zap. Becoming much more deadlier with Heal and are also a great counter to Night Witch and Graveyard. They are very deadly with Three Musketeers as they can be used to also bait Fireball and Poison. Fast, cheap, great for cycling and great for baiting zap. Archers can be split into two lanes, have great range, deal a lot of damage, and do not die to Log or Zap. They are also great against Graveyard, and excellent on defense when used with a support distractor like Knight or Ice Golem. Tombstone is probably the best defensive building in the game right now because it’s the best defense against Battle Ram, while also costing only 3 Elixir, as opposed to a 5 Elixir Inferno Tower. Tombstone can effectively counter Hog Rider, P.E.K.K.A, Golem, Giant, and other big threats. Inferno Tower is still the best tank-killing defense. The best counter to Golem, Giant, P.E.K.K.A, Lava Hound, Balloon, and so on. Dart Goblin has one of the biggest ranges in the game. He can lock on an Arena Tower quick and deal quick damage before your opponent can usually react. He’s also an excellent bait for The Log. Although Skeleton Army isn’t as threatening as Goblin Gang on offense and dies to Zap, it does an immense amount of damage on defense quick. Just make sure you have another card that can bait Zap and Log. Bowler is one of the best defensive troops in the game. Killing and pushing back most troops. Unfortunately, his inability to target air troops is what sets him apart from the Executioner. Balloon is a super deadly offensive card when behind a tank such as Lava Hound. However, with Three Musketeers, Night Witch, Executioner and Tornado being everywhere in this meta, Lavaloon isn’t as intimidating as it once was. Lava Hound struggles in a meta where there’s so many Three Musketeers and Night Witch users. Night Witch can basically summon Bats to deal with Lava Hound, while focus on counterpushing you with a tank. Musketeer is a still a very useful long ranged attacker in many decks, but her inability to counter Graveyard as effectively as Archers is what sets her apart. Valkyrie is a very underrated card in this meta. She’s super useful against Graveyard Poison users, Battle Ram users, and also great against Three Musketeers. Just use another distractor like Ice Golem in front of her when countering a big Three Musketeers Battle Ram Push, and watch her quickly counter it. Witch is also one of the best counters to Graveyard, able to kill Skeletons in one hit, while also being able to survive Fireball and Poison. She can also be super powerful on offense. If you opponent has a counter such as Executioner or Bowler, just make sure to play Witch on the other lane. Mini P.E.K.K.A is also another very underrated card. He’s an excellent counter to Battle Ram, Bandit, Hog Rider, Giant, Golem, Royal Giant, and so on. You can even use Mini P.E.K.K.A with an Ice Spirit behind or Ice Golem in front to effectively counter Three Musketeers. Although Lumberjack isn’t as tanky as Mini P.E.K.K.A, he can provide a very beneficial Rage after his death, and this can be very deadly in the right deck. 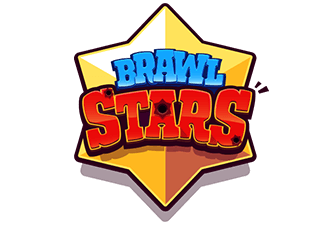 Something like Giant, Night Witch, and Lumberjack can be very dangerous as Rage will also increase Night Witch’s spawn rate. Ice Wizard used to be one of the best cards in the game, and the best defensive card in the game, but unfortunately it has fallen a lot due to its inability to kill Skeletons and Bats in one hit. Ice Wizard is still one of the best cards in the lower Arenas, but at the top, it fails to find good homes. Fire Spirits are very underrated as well, being very useful taking out a Minion Horde on Heal quickly, dealing tons of damage to Battle Ram and Barbarians, can finish off a Night Witch and her Bats, and can also be used to quickly finish off 2 splitted Musketeers. They need to be used more. Furnace is decent, but fails to counter big tank threats such as Golem, P.E.K.K.A, and Giant. While also isn’t as effective against Battle Ram and Hog Rider as Tombstone is for less cost. Cannon has dropped a lot, as it just doesn’t provide the same defensive value as Tombstone. Tombstone can take a charge from Battle Ram and continue to defend against the Barbarians with Skeletons. Cannon can’t, but has the benefit of not being weak to The Log. Inferno Dragon is seeing a lot more use, especially in those bridge spam decks. However, it’s still a very easy card to counter, and Ice Spirit and Zap are everywhere in this meta. Guards are another very underrated card, having the advantage of not being weak to The Log, like the Goblin Gang is. Guards are an excellent defense against Graveyard, Bandit, 2 Musketeers, and many other big threats. Royal Giant is a decent card. However, because it’s a Common card, it’s very easy to level it up, and so you have a lot of low level players with high level Royal Giants, and that can be annoying. When facing Royal Giants, make sure to plan out a counterpush before killing the Royal Giant. If you only focus on killing the Royal Giant, then you won’t win. Like Royal Giant, Elite Barbarians are also decent, but are a Common card. Overleveled Elite Barbarians can be quite annoying. Start working on your deployment reflexes or these guys are going to get to your Arena Tower. 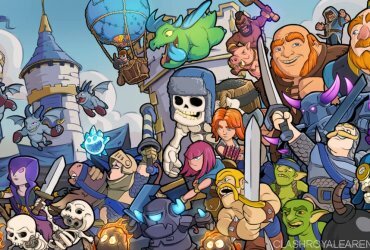 Barbarians are an excellent defensive card against many threats such as Elite Barbarians, Royal Giant, Battle Ram, Three Musketeers, Graveyard, and almost all tanks except P.E.K.K.A. Problem is, they’re very weak to spells such as Fireball and Poison and are too slow to pose much pressure on offense. Freeze can be a very deadly card if you can catch your opponent off guard. A well timed and placed Freeze Spell can easily win you the game. Unfortunately with The Log, Zap, Ice Spirit, which are three of the most used cards by top players being everywhere, it’s really hard to take advantage of the Prince’s charge. He’s 5 Elixir and easy distracted by low HP troops. However, with the right support he can be very deadly. He has very decent HP. Barbarian Hut is an excellent defense, but it’s the most expensive building in the game. It’s just too risky, regardless of where you place the Barbarian Hut, a Hog Rider or Battle Ram can bypass it and target your Arena Tower on the other lane. Giant Skeleton is an excellent defensive troop, with the ability to shut down big pushes like a Rocket. But the problem is, he’s too expensive and his death damage can go to waste easily. He doesn’t have that much HP to be a great tank like the Giant, and a smart player will always target the Giant Skeleton from behind to escape his death damage. Wizard isn’t bad, but he’s just so outclassed by the Executioner. Executioner can target multiple troops behind his target, survive Poison and Lightning unlike the Wizard. He also has a bigger splash radius and area of damage than the Wizard. Sparky is simply the worst Legendary card, being countered by like half the cards in the game. Sparky is very good in the lower Arenas, but struggles against smart players in higher Arenas. Dark Prince just can’t find a good place in this meta. He has that nice splash damage, but is easily surrounded and killed by something like Goblins. Valkyrie is just a better option and is so much more useful against Graveyard and Three Musketeers. Dark Prince does have that sweet charge, but again Log, Zap, and Ice Spirit are everywhere. Bomber does a lot of splash damage, but he only targets ground units and has very little HP, and his range isn’t that great. He’s just too easy to beat and doesn’t help against air troops. Mirror is a pretty fun card, but isn’t the best for competitive play. It’s just not very safe to use the same card twice, unless you’re using a bait deck. But even then, paying 1 more Elixir to use the same card twice isn’t always rewarding. However, I’ve found Mirror to be a lot more effective in 2v2 mode where you can Mirror spells or Miner to continually deal damage to win. Like Mirror, Clone is another very fun card, but just isn’t the best card for competitive play. Log, Zap, and Ice Spirit are everywhere and can kill clones quick. Rage is another fun card to play around with. Try out Rage with Witch and Night Witch, it not only speeds up their attack rate, but is also speeds up their Skeletons and Bats spawn rate. Spear Goblins are good for chip damage, but oftentimes it’s not worth wasting 2 Elixir for some small chip damage. These guys are just too weak and die to Zap. Goblins are a lot better and do a lot more damage and do not die to equal level Zap. Tesla just doesn’t fit right now. Inferno Tower is way better for killing tanks and Lavaloon. While Tombstone and Cannon offer much more value against ground threats for cheaper. The Spear Goblin Hut just isn’t intimidating, costing an expensive 5 Elixir to spawn Spear Goblins, the weakest troops in the game. You can simply just ignore the Goblin Hut and let the Spear Goblins deal chip damage and end up winning because you took advantage of your opponent spending 5 Elixir on this card. Bomb Tower is quite a powerful ground defense, but it’s a very expensive 5 Elixir that can’t touch air units. If you’re using Bomb Tower, then you better pray your opponent doesn’t use something like Lavaloon. Even then, this card isn’t that good against tanks either, like Giant or Golem or even Royal Giant who can outrange it. I am doing a $200 iTunes or Google Play giveaway ($20 gift cards for 10 chosen winners) for the whole month of July! I am also doing a contest about the best decks with the total prize up to $1,000 (sponsored by Supercell). To enter the giveaway, just Subscribe to my YouTube channel, Like the video, and leave a comment in the video above! So I hope you guys liked my rankings of all the cards in Clash Royale. The game is always evolving, so don’t expect these rankings to not change in the future. Draft Chest – Choose Your Own Rewards!